Looking for ways to keep cool this summer? The Times Herald-Record, a paper in New York State's Hudson Valley, has this low-tech list of suggestions that includes using a damp bed sheet as a "blanket" at night and practicing a Yoga breathing method to rid the body of heat. 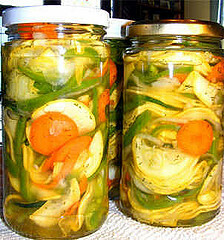 "Spicy foods make you perspire more, which cools the body. Spices also help stop foods from spoiling as quickly, and give you an endorphin rush that feels good in any temperature." Wow! Who can say no to food that cools you off, tastes great, improves your mood, and also may help you avoid Alzheimer's? It's time to whip up a bowl of fresh, homemade salsa. This is absolutely the best time of year to get fresh ingredients (at least it is if you live north of the equator). Vegetable gardens and farmers' markets are overflowing with fresh tomatoes, onions, and peppers. You can make quite a respectable salsa using with just those ingredients, but here's a recipe that's slightly more complicated. The addition of some citrus really brings out the flavor of the other ingredients. You get a sweet-hot taste that's absolutely delicious. 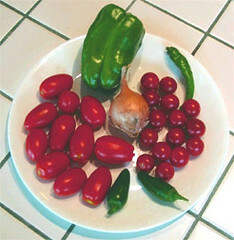 Here's how to turn this plateful of ingredients into yummy salsa. We use a food processor and fresh ingredients from the garden. Canned tomatoes make perfectly good salsa. They have a better taste than the tomatoes from the grocery store in the winter. But I like to take advantage of the fresh ones during the summer. Remember that salsa is a forgiving recipe. You can add more of ingredients you like and make substitutions if you need to. 1. Cut the bell pepper in chunks and remove stem and seeds. Cut the stems off the jalapenos and cayenne and slice into small pieces. Seed them as well if you want a milder tasting salsa. 2. Peel the onion and slice into chunks. 4. Place the hot peppers, onion, and margarita mix into food processor and dice into tiny pieces. Add bell pepper chunks and chop just for a few seconds. 5. Add tomatoes to pepper and onion mixture and chop until the desires consistency is reached. Less for chunky salsa, longer for smoother salsa. 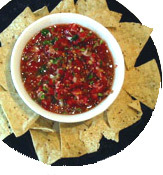 Let the salsa sit for a few minutes to let the flavors meld together before serving. 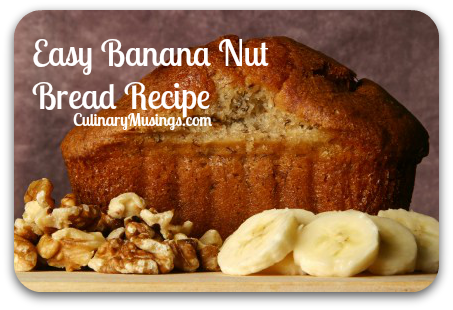 This keeps several days in the refrigerator, but there's usually not any left in our house!